Home » Posts » Statements » No to the Escalation – End the Afghanistan War Now! Freedom Road Socialist Organization denounces the escalation of the bloody and unjust U.S. war in Afghanistan. We condemn the decision made by the White House and Pentagon to ‘surge’ over 30,000 U.S. and NATO forces into Afghanistan in an attempt to stabilize a failing occupation regime. The escalation of the war comes at a critical moment for the U.S. war in Afghanistan. According to U.S. military reports, U.S. and NATO casualties have increased 64% over the last ten months. Compared to the first year of the occupation, casualties among U.S. and NATO forces have risen by 603%. Insurgents control vast swaths of the countryside and frequently threaten to overrun occupation forces in major cities. Supply routes are constantly threatened by resistance forces and many areas of the country are completely inaccessible by occupation troops. Some military analysts say that without a surge in forces, the puppet government in Kabul would not make it through the coming year. The occupation regime is crumbling, and rapidly. The corrupt puppet government installed by the U.S. and its allies, led by Hamid Karzai, is universally despised by Afghans and lacks any kind of legitimacy. The U.S. tries to strengthen this puppet government while hopelessly waging a counter-insurgency campaign to defeat over 140 Afghan resistance organizations fighting for national liberation from foreign occupiers. However, no matter how many tens of thousands of troops are poured into the country, it is unlikely to stop the tide of resistance to the U.S. occupation. In fact, as the people of Afghanistan have demonstrated throughout their history, they will always resist foreign occupation until they are free. While this resistance is demonized in the U.S. media, in fact, it is the right of occupied peoples to resist the aggressors by any means necessary. And it is the task of those who stand for justice and liberation here in the United States to support the people of Afghanistan in their heroic struggle for national independence. The U.S. is currently undergoing the worst economic crisis since the Great Depression. As millions of workers lose their jobs and their livelihoods and millions more are thrown out of their homes, the contradiction between the $1 trillion-plus ($1,000,000,000,000) spent on war and occupation in Afghanistan and Iraq and the resources desperately needed here at home has never been sharper. As we continue to organize to fight against the cutbacks, layoffs, foreclosures and evictions in our communities, we need to demand that funding be cut off to the occupation of Afghanistan and Iraq and that those resources be used to meet the people’s needs instead. Events have fully confirmed the truth of this statement. After the U.S. invasion of Afghanistan, the door was opened for the catastrophic invasion and occupation of Iraq, the Israeli war against Lebanon and the murderous assault on Gaza, the threats and sanctions against Iran and the air strikes on Somalia – just to name a few examples of U.S. intervention in the region. It is the people who make history and it is the masses of working people who can stop this war. 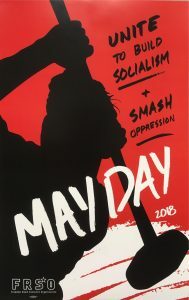 It’s time for us to step onto the stage of history and put an end to this terrible system of war, exploitation and oppression – imperialism – and set up our struggle to replace it with the system of peace, justice and equality – socialism. The sooner we can end the system of U.S. interventions around the world, the sooner we will reach this goal.